The number one most valuable single stamp in the world is the Tre Skilling Yellow from Sweden. This famous stamp is the result of an error in printing. Originally, the 3 skilling stamps were printed in green, but it would seem that at least one sheet got accidentally printed in yellow, which was the colour for the 8 skilling stamps! Issued in 1855 and postmarked in 1857, the stamp was found on an envelope by Georg Wilhelm Backman, a young schoolboy. It is the only one of its kind in the world, which definitely contributes to its worth, and this, despite the fact that it has been reperfed in one section and has had a tear repaired (repairing or altering a stamp often lessens its value). There has been a lot of controversy surrounding this stamp – many experts at one time claimed that it is was a fake. Some believed that the green colour of an original 3 skilling stamp had been bleached from the paper and the yellow colour added after. Even the Swedish Postal Museum declared it to be a fake, but later retracted their claim after two other independent examinors announced that it was genuine. It is now widely recognized to be authentic and one of a kind. The stamp has been owned by many famous persons, including famed collector Baron Philipp de la Renotière von Ferrary and King Carlos II of Romania. The most famous sale of the Treskilling Yellow was at an auction conducted by David Feldman. In November 1996, a consortium of buyers purchased the Tre Skilling Yellow for $2.3 million USD! However, they were not able to come up with the money in time and had to forfeit their purchase. The stamp was then resold privately by David Feldman in 1998 for an undisclosed amount. More recently, in May 2010, David Feldman once again auctioned off the famous yellow error stamp “for at least the price it set a record for in 1996”. It seems the buyer was Armand Rousso, a famous French businessman. So, the Tre Skilling Yellow still remains the single most valuable stamp in the world! According to the 2013 Scott World Stamp catalogue, the catalogue value of a used Treskilling Yellow is $3 million. 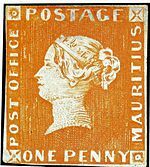 The number two most valuable stamp in the world is the Mauritius 2-penny Post Office blue. This stamp recently set a new world record when it was auctioned off in 2011 by Spink for $1.67 million USD. One of the reasons why Mauritius stamps attract the attention of philatelists is because Mauritius was one of the first British colonies to issue stamps outside of Britain. The 2-penny blue was issued in 1847 and is one of the rarest stamps in the world-only 26 are thought to be left. Many rumours have surrounded the 2-penny blue. For a long time it was believed that the words « Post Office » on the stamp were a mistake since subsequent stamps were printed with « Post Paid » instead. However, it has been established that this wasn’t an error and that « Post Office » was correctly printed, even though the wording on the stamp changed the following year. According to the Scott World Catalogue, the catalogue value of the stamp in mint condition is $1,7 million. The number three on our list is the 1847 Mauritius 1-penny Post Office red. This is the sister stamp to the 2-penny blue we mentioned previously. This stamp would probably get more if it were auctioned off today, but the last time is was sold was in 1993 by David Feldman. There is a little bit of confusion regarding the price since the David Feldman Auction webpage states it sold for $1,700,00 (which is obviously a typo). All other sources state it sold for $1,072,600 USD (so I think there is just a “0” missing in front of the “7” on the auction webpage). Scott World Catalogue lists its catalogue value as being $1,25 million for a mint stamp and $900 000 for the used. Coming in at number four is the 1856 British Guiana Magenta. This famous provisional stamp was issued when the British colony of Guiana ran out of stamps. A local company was hired to print the emergency stamps. To be very honest, it’s not much to look at! It is an imperforate stamp that is shaped like an octagon because the four corners of the stamp were snipped off. It is magenta coloured with black printing on it. It has the image of a sailing ship on it and a signature on the left side of the stamp. It is considered so valuable because, like the Treskilling Yellow, it is the only one of its kind in the world. Many famous persons have owned it, but right now it belongs to the estate of John du Pont, who purchased it in 1980 for $935 000 USD. Mr. du Pont went to prison in 1997 for the murder of a wrestler, and died while still in custody in 2010. His estate still has not been settled, but once it is, who knows what his heirs will do with this famous philatelic jewel? Who knows what it would sell for now-over 30 years after it was last purchased? UPDATE : It sold at Sotheby’s in June 2014 for $9.4 million! Our last stamp is the Benjamin Franklin Z-Grill, issued in 1868. This rarest of USA stamps was last sold in 1998 for $930 000 USD. It is a 1¢ blue stamp that features Benjamin Franklin (obviously). What is a Z-grill? Back in the day, postal officials had to come up with a way of preventing counterfeiting, and also, preventing people from reusing the same stamp twice. Some individuals would wash away or remove the cancellation ink in order for the stamp to look new and reaffix it to an envelope. A «grill» is a pattern that is embossed, or pressed into the paper-this pattern looks like little squares. These impressions in the stamp paper make it absorb cancellation ink more readily, thereby making it more difficult, if not impossible, to remove. Many different grill patterns were invented and named after letters of the alphabet ( A-grill, J-grill, Z-grill and so on). The «Z-grill» was only used for a short time before it was discontinued, therefore making the grill pattern on this stamp very rare. While the Benjamin Franklin Z-grill was purchased by Mystic Stamp president Donald Sundman in 1998, he traded it to Bill Gross in 2005 for a block of «Inverted Jennies». At the time of the trade, the Inverted Jennies block was worth $3 million USD, so any guesses as to how much this famous Z-grill would go for today at auction? Scott World catalogue lists the Benjamin Franklin Z-grill at $3 million. Regarding the stamps…All in all this looks like a lovely old time accumulation. I can spot some ‘not so common’ items, but the condition (especially rust/mold) is a real value killer. Question. My dad just found an old stamp collection that has over 400 stamps in it. What is the best course of action for him to sale them and who to? Sir,even i have the stamp which are from”want list” I want to sell ……..? Hi my name is Chris and i found a stamp that saystop value on it with the number 10 and its all in red. On the bottom in say cash value is 10 mills. Is it worth anything? And how old is it? It seems to me that I recall that the Scott# 164, 24 cent purple Scott is unique, and the rarest stamp. What’s His Name with the complete American collection traded a block of Inverted Jennys to get it. It’s a regular stamp, not a variety or error. sounds like an art deco stamp. Esthetic worth only – no real $$. What is a Art Deco stamp then ? Before my mother died, we learned that her father was a.officer in the CHI CHI HARU concentration camp. She lived there from 1938 until the Russians ousted the Japanese from China. She left me a stamp collection from that era. I have researched some and found that they have value to them. But some I have never seen anywhere. Most look like overprints of past rulers with Japanese symbols imprinted on them. Does anyone know if perhaps these can be of real value? En hèritage, j’ai reçu de mon oncle un album de timbres; Des années 1889, 1930 1950 . Je dèsire vendre l’ensemble à de vrais collectionneurs.